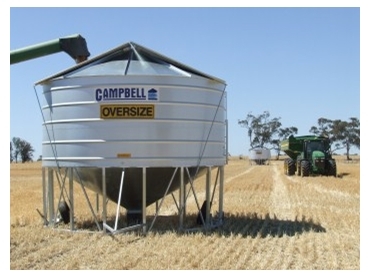 Campbell Silos are suppliers of a range of field bins ideal for storing grain at harvest time to protect it from insect attack. Standard field bins from Campbell Silo's are built with a galvanised steel base and a zincalume tank and have a 30º cone angle. They are available in four sizes and specifications; 350 bag (29 ton), 400 bag (33 ton), 450 bag (37 ton), and 500 bag (41 ton). Superphosphate field bins are built with a galvanised steel base and tank and have a 35º cone angle. They are available in three sizes and specifications; 320 bag (27 ton), 370 bag (31 ton), and 420 bag (35 ton). Also available, PTO field bins are available in 370 (31 ton) and 420 bag (35 ton) sizes and specifications and also have a galvanised steel base and tank. These field bins have a 35º cone anlge and a 22'9" x 12" discharge auger and easy lifting springs. maxilock bolts in tank for greater strength.